And some, it seems, examine the worst horrors with notepad in hand, keen to work out how they can achieve the same and get away with it. So we come to the atrocities of the nation of Israel. Then it seems clear that Benjamin Netanyahu has launched a little Holocaust, all of his own, against the Palestinian people. I know – accusing Israel of behaviour similar to that of Nazi Germany is an anti-Semitic trope. We’re all told we must not do it. But that implies responsibility on the part of that country – not to emulate the Nazis in any way. It is a responsibility that the current Israeli government has scorned. 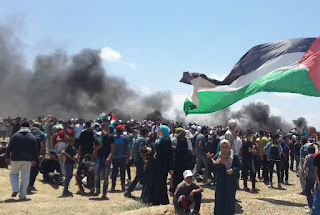 Netanyahu and his cronies are attacking Palestinian people purely because of who they are, and the fact that they live on land and occupy property he wants to steal. A statement is not anti-Semitic if it is factually correct. And it is factually correct that Benjamin Netanyahu and the government of Israel are carrying out the racist, Islamophobic extermination of the Palestinian people. The massacre of nearly 60 unarmed Palestinians – with more than 2,000 injured – is just the latest item on that agenda. That it should happen on the 70th anniversary of the establishment of Israel as a nation only amplifies the crime. What happened – did Mr Netanyahu wake up and say to himself, “This is a great day – I think I’ll celebrate by murdering some Arabs”? That is, after all, what he did. And what response does he receive from the international community and the media? Silence – or unrestrained approval. It seems the threat of being labelled “anti-Semite” hangs heavily on some. To my colleagues in the mainstream media who don’t have the guts to stand up against brutality, I say: Shame on you. You disgrace us all.